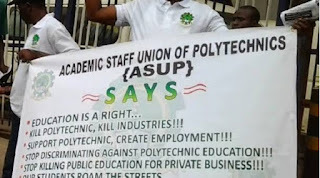 The Academic Staff Union of Polytechnics (ASUP) has threatened to embark on a one week national strike over alleged failure of the Federal Government to implement the agreement it reached with the union recently. Mr Chris Nkoro, ASUP National Publicity Secretary, said the decision was taken during the 94th National Executive Council (NEC) meeting of the union, held from Monday to Friday at the Shehu Idris College of Health Science and Technology, Makarfi, Kaduna State. 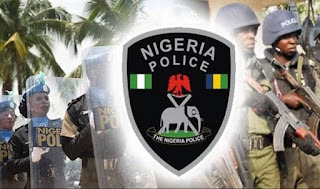 The News Agency of Nigeria (NAN) recalls that the union had early in February, suspended its two-month industrial action over non implementation of the said agreement by the federal government. Nkoro did not however say when the planned strike would commence. “The union views the persistent lethargic disposition of the Federal government and its agencies towards re-negotiation of FGN/ASUP agreement as a ploy to cripple the system and perpetuate suffering on members. “The NEC urges the federal government to without further delay, commence the re-negotiation process. “The NEC, sadly observed that while the union had agreed on the terms of enrolling of the sector into Integrated Personnel Payroll Information System (IPPIS), some rectors have continued to use backhand ploy to enroll some institutions without recourse to our union’s documented peculiar concerns.